Skerries RFC welcomed second place Rainey Old Boys RFC for their Ulster Bank Division 2B League match to Holmpatrick last Saturday 27th January 2017. The entire Skerries Squad were fantastic in their winning performance and are to be congratulated for displaying superb tackling and attacking skills with good use of the ball when in possession and when not in possession of the ball they attacked Rainey’s ball carries with fierce tackles resulting knock on’s and regaining possession at vital stages during the game. The Skerries player’s all produced a wonderful display with their Captain Michael Sherlock and returning past Captain Ross McAuley providing good leadership with great break outs from defence with support from Michael Turvey. The defensive tackles from No’s 6,7,8,9,10,12 sealed off the opposing teams line break runners and achieved a number of valuable turn overs. Skerries scored two tries in the first half, one by Ross Dempsey who received the ball from Eoghan Carron from behind a maul near the try line while a similar maul resulted in Mark Nally crossing for a try. Unluckily neither try was converted. A penalty for each team went between the posts leaving the half time score Skerries 13 – 3 Rainey Old Boys. The second half found Skerries RFC defending into a strong breeze. The Skerries forwards both at the break down, maul and lineout put good pressure on the opposition gaining valuable possession and preventing them having any opportunities to cross the Skerries line. 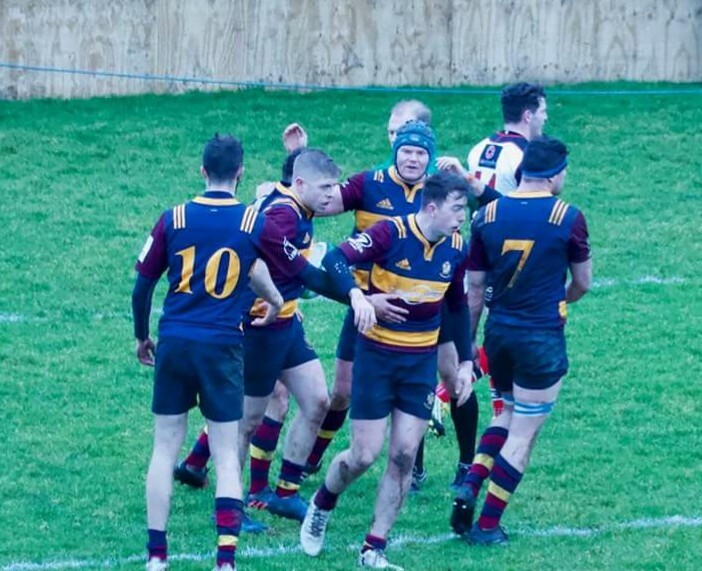 However, the referee, in his wisdom, decided that the Skerries scrum was persistent in offending and awarded a Penalty Try to Rainey Old Boys RFC in the 60th minute. In the last quarter of the game, the fitness and tight game plan of Skerries was beginning to pay dividends with serious attempts to score by right wing Paul Devitt and Ruairi Woods ( replacement scrumhalf).Indeed Ruairi Woods with a good quick ball from Ross McAuley attacked the opposition on the blind/narrow side of the scrum and was supported by Paul Devitt on the wing. These moves caused the Rainey Old Boys defence difficulties and enabled Skerries to play the game in the oppositions half against the strong wind. They say the cream always rises to the top and the Skerries supporters on the day including all The Ladies who attended the President’s Ladies Lunch were treated to a spectacular try by right wing Paul Devitt who gathered the ball in the middle of the back line going left, a move that was instigated by out half Billy Mulcahy. Devitt sprinted through a gap in the defence and with three brilliant hand offs scored a try to the left of the posts that was converted by Billy Mulcahy. The Skerries team tried their best to score a bonus point try which alluded them in the final minutes leaving the score Skerries 20 – 13 Rainey Old Boys. This performance was a magnificent display and reflected the great work done on the training ground since their previous match. A huge well done to all the players, coaches and extended team. Skerries next match is at home next Saturday, the 3rd of February, against League leaders Old Crescent RFC, an exciting prospect! Subs; 16 ,Conn Marrey, 17 John Sherwin, 18 ,Tom O’Hare, 19 Ruairi Woods, 20 Dara Lowndes.